Play Chilli Heat Slot Online with 500 Free Spins! Chilli Heat is a 5 reels, 25 paylines online slot game by Pragmatic Play. Chilli Heat has Sizzling Money Bags Respins and Improved symbols Free Spins with an RTP of 96.5%. Chilli Heat is hot and spicy! You can practically feel the intensiveness pop out from your screen to your face, and even your body. You will find yourself inadvertently nodding your head and stamping your feet to the accompanying salsa beat of this woman online slots. One would easily forget the game and think the enthusiasm of the music only wants you to party, nothing more. However, in Mexico, you know gaming goes with music. So, welcome to Mexico, the countryside of fun, games, and music. The graphics are clear with a mature backdrop and reel board colours. The Chilli Heat online slot by Pragmatic Play offers 5 reels in 3 rows and 25 active paylines. The slot has various spin features including the spin, the re-spin, and the delightsome Free Spin. It is compatible with all devices. However, playing on a non-responsive platform or website might not be the best way to have a good game experience. Do you want a real online gaming experience? Dig your hand through RoseSlots.com or check out our sister site - Amigo Slots and play Chilli Heat slot for free with 500 free spins. The reel includes low paying A, 10, J, Q, and K. It also includes a glass of Tequila, a dog, and a sauce. The highest paying symbol is the guitar playing elf. The Chihuahua dog, and the Chilli sauce bottle, and the tequila glass symbols are the highest paying symbols in this online slot. The guitar elf awards 8 times the total stake if you are able to get him 5 times. The Chilli heat logo is the Wild. It replaces every symbol to make winning combinations, except the Scatter and the Money sacks. The Money sacks are ladled with terrific wealth values too. 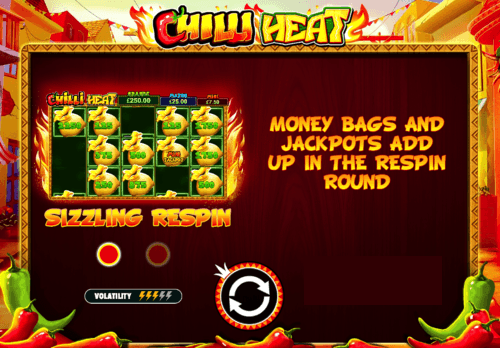 Chilli Heat online slots game gives a total coin value of 25, and the play is permissible from £0.25 to £125 per spin. This video slot offers 4 bonus rounds to open the portal of great winning. And it also encourages a player with a Return to Player (RTP) value of 96.52%. Sizzing Money Respins: This feature becomes active when you get 6 money symbols on the same spin. This will bring you to a set of new reels where you will be awarded 3 re-spins. The re-spin feature is unlimited. Jackpot: Filling all the 15 spaces will win you a combined amount of the whole wins, and a jackpot prize. This is 1000 X your total stake. There is a better chance of this win when the Moneybags icons are collected bountifully. Free Spin: 8 free spins are awarded when you are able to gather three moustached sun Scatters on reels 2, 3, and 4 within the same spin. This is one of the best bonanzas, and in fact, the most win-encouraging one. This is because it eliminates the low payout symbols. The Free Spins can be retriggered to an extent of infinity. Rose Slots is the Number 1 site to play chilli heat slot with our fantastic 500 Free Spins Offer and over 550 online slots. If you are looking for our top slots then check out, Fluffy Favourites, Bonanza, Rainbow Riches and Starburst. This five reel, three-row slot from Pragmatic Play focuses on fun and fiestas, with a Mexican theme, and 25 paylines on offer to lucky players. RTP comes in at a generous 96.52%, and there are both free spins and jackpot modes as bonus features. Are you ready to take a ride into Mexico? If so, saddle up, grab your sombrero and a bag of nachos, tune up your guitar and prepare your stomach for a healthy serving of red hot chilli, because Chilli Heat by Pragmatic Play is packing Mexican flavour in spades. It may feature just about all the stereotypes about Mexicans you can think of, but it’s done with love and a wink, all in the spirit of bringing you a fun online slot game that entertains with every spin of the reels. When a developer makes a slot game based around a nationality, they always go for the most cartoonish elements of the nation’s culture to drive the theme home; and if you don’t believe us, ask the Irish! Therefore Mexico gets the same treatment here, but the result is a fun and vibrant atmosphere that’s bound to put a smile on your face. Chilli Heat carries itself with a great deal of humour and cheek, and we imagine Pragmatic Play had as much fun making it as we have played it. Gameplay takes place in a rural town in Mexico, accompanied by the unmistakable sound of a mariachi band providing the atmosphere, and cacti in the background just in case you didn’t get the message. As a nice touch, every time you find a winning line, the band give you a little burst of trumpets and castanets, as if the game is actually happy for you when you’re able to take money out of it! In terms of the reels themselves; you’re spinning a standard 5x3 layout set into a frame that’s been appropriately decorated for the environment. Even the lowest value symbols have been given a Mexican twist as well; they may consist of the traditional playing cards J, K, Q and A, but the font and style are decidedly Mexican. In fact, they remind us of nachos! Above them sit a shot of tequila, some chilli sauce (of course! ), a cute chihuahua wearing a neckerchief, and your mariachi player, wearing his sombrero and carrying his guitar. The game’s logo is wild, and can substitute for any of the standard symbols to form winning combinations. The non-standard symbols are the scatter, represented by the sun, and a further bonus symbol in the shape of a money bag. Both symbols have implications for the game’s bonus features, so perhaps we should look at them in more detail. From the look and feel of the game alone, you can tell that Pragmatic Play’s priority in creating the game was to make something that was fun and easy to play, instead of going overboard with complex and detailed bonuses. With that in mind, they’ve limited the bonuses to two, but both of them are great additions to the game, and carry the potential to bring you some good wins. The first of the bonus features is a free spins round; not exactly groundbreaking or hugely original, but always a welcome sight in any online slot. To trigger the feature, you need to land three of the sun scatter symbols on reels two, three and four. Doing so rewards you with eight free spins as a starting point, but you can add to these by finding more scatters as the free spins progress. The real news with the free spins round, though, is that the lower card symbols are removed from the reels during the spins, so any winning combination you do find is of higher value. The second feature is something Pragmatic Play refer to as Money Respin mode, although you might understand it better as a jackpot feature. To trigger this feature, you need to find six money bag symbols as a starting point. They can be anywhere across the reels, in any order. That might sound like a lot, but you can also trigger this mode during the free spins bonus, when there are fewer symbols on the reels and therefore more chance of getting the six you need. Once you have six money bag symbols, they will lock in place, and you have three free spins to try and find some more. If you do, that will also freeze, and another free spin is awarded. This will continue until one of two things happens. You’ll either run out of free spins, in which case you’ll win the total cash amount printed on the bags of money, or you’ll have completely filled the reels and rows with money bag symbols. That bags you the maximum jackpot offered by the game, which is 1000x your initial stake. Smaller jackpots are also available, based on whatever logos or values are printed on the money bags. It all makes sense when you’re playing the round! Pragmatic Play is the developer behind Chilli Heat, they have many well known games including Wolf Gold and Great Rhino. They are a relatively new to the scene, launching in 2007, with only 100 games in there portfolio, but those games have made a real dent in the market share of their competitors. “The reels are hot in Chilli Heat™, the 3x5 video slot. The fiesta starts with stacked Wild symbols and heats up in Free Spins where only high-value symbols are present. Collect money piñatas in the Sizzling Respin round, where only money symbols spin for big wins and jackpots!”We feel compelled to point out that there’s no way those symbols are piñatas. They’re definitely bags of money! You can take a look yourself by playing the game with us on roseslots.com. Pragmatic Play’s catalogue of games displays a wide range of variety. They don’t tend to make sequels to games they’ve made in the past; more often than not they turn their hand to something new when they’re doing with one topic, and if they do go back over old ground, it tends to be when making animal-themed slots. Because of that, there isn’t a sequel to Chilli Heat on their roster, or even another game that’s set in Mexico. That’s not to say they’ll never go back to it; Chilli Heat was a 2018 release, and so it’s still recent news. If it stays popular, that might incentivise the developer to give us more on the same theme. It’s not unknown for Pragmatic Play to make games based on a nation’s culture or traditions, though. In fact, they’ve done it more than once. Ancient Egypt: No prizes for guessing which location this game is set within! Ancient Egypt may use a different location for its scenery, but the principle behind the game is the same. The sounds and symbols of the Egypt of old permeate throughout this online slot, so you can expect to see hieroglyphics, Pyramids, the Eye of Horus and maybe even a legendary Pharaoh or two. In terms of the game itself, it’s a little more stripped back than Chilli Heat is, with one primary bonus feature coming in the form of a prize picker round. The RTP of Ancient Egypt is 96.13%. Peking Luck: If you know your geography, you’ll have guessed from the name that Peking Luck is set in China. Again, the template of the game will be familiar to anybody who’s played Chilli Heat; play takes place on a 3x5 reel layout. There’s more to enjoy for fans of bonus features in Peking Luck than there is in Ancient Egypt; but only one can be activated from the base game (namely a free spins round). The free spins game leads on to a prize picker, which will determine the number of free spins a player gets, as well as the multiplying factor that will be applied during those spins. Therefore the game can be a little mean or very generous, depending on your luck! The general RTP comes in at 96.5%. This is visually a very attractive game, which is respectful towards the culture it borrows its imagery from. It may be true that there are no other Mexican themed games in Pragmatic Play’s locker, but there are plenty of them available from other developers. It’s a well-served market, which indicates it must be popular with players. Perhaps that’s all down to the fact that Mexicans are known for their love of a good party, and who doesn’t like an upbeat atmosphere when they’re playing a slot game? Here are just a few of the alternative games that share inspiration with Chilli Heat. Chilli Gold 2: The lesser known developer Lightning Box has a strong entry in the field of Mexican themed games. In fact, the symbols on the reels are more or less the same; they’ve just chosen to go slightly more ‘cartoon’ with the tone than Pragmatic Play has with Chilli Heat. There are notable differences between the two games though; this is a game with a wider 5x4 playing area, and along with it, more paying lines, with a total of 40. The Chilli Gold 2 bonus offerings are strong too, with a jackpot game, a free spins round and a ‘double or nothing’ gamble for players who are feeling lucky. The game is close to Chilli Heat in look, feel and quality; if you enjoy one, chances are you’ll enjoy both! RTP comes in at 95%. Esqueleto Mariachi: How’s your Spanish? Do you need us to translate the title of this game for you? If so, it comes out as ‘mariachi skeleton’. As you may or may not be aware, the annual ‘day of the dead’ is a major festival in Mexico, and this slot game uses it as a backdrop and a theme. Red Tiger Gaming is the creators of Esqueleto Mariachi, which somehow manages to be upbeat despite its somewhat morbid topic. Like Chilli Gold 2, the game has an expansive 5x4 set of reels, and the same number of paylines at 40. The general RTP is 96.06%, although the game occasionally tries to help you out by randomly generating extra bonuses. Listen out for the sound of a trumpet; when you hear it, additional wilds might appear on your reels! It’s a gun game, but a slightly more complicated one than Chilli Heat, and so it might not be for everybody. Taco Brothers: This Elk Studios game is nothing if not original! If you like slot games that come with a story, chances are you’ll love this. Taco Brothers takes us back in time to 19th century Mexico, where everybody’s tacos are at risk of theft from an evil boat captain. As terrible a criminal plan as that clearly is, for some reason the Taco Brothers are the only people who can rescue the town. Or the tacos. Or both! They’ll need your help to do it, and so prepare to follow their beautifully animated adventures across this attractive slot game, which offers 243 paylines and RTP of 96.30%. When we looked at Pragmatic Play as a developer earlier on in this review, we mentioned the fact that they consider themselves to be masters of the mobile format. Their strategy is all about mobile slots, and they claim to start designing their games on smartphones and hand-held devices, then work backwards to make them playable on computers. Because of that, we expected a fantastic playing experience when we loaded Chilli Heat up to play on our smartphone. Did we get what we wanted? Yes we did. Pragmatic Play almost never put a foot wrong when they make mobile versions of their slots, and they’ve struck gold again with Chilli Heat. The graphics are just as sharp and bright, the soundtrack is just as clear and crisp, and everything looks, sounds and plays just as it should. The game works perfectly well no matter which way around you hold your phone; tilt it on its side and the buttons simply rearrange themselves to be a more convenient fit. Turn it the right way up again, and they go back where they started. The playing area isn’t shrunk down in order to fit anything in or take anything away, and it never feels awkward to play at any time. Whereas the majority of slot games we review for mobiles are fine in landscape mode, but suffer a little if you play with your phone held the right way up, we think Chilli Heat is actually better when played from the portrait perspective. Nothing of the game is lost, the reels are still the same size, and you get to see a little more of the attractive background scenery. Chilli Heat is as close to perfect a transition from online slot to mobile slot as we’ve seen; and we only wish every developer managed to get it as right as this every time. Our hat is off to Pragmatic Play! In case we haven’t made it clear enough yet, Pragmatic Play are well known and well loved in the online slot world. They’re popular with players, other developers consider them to be a quality brand, and the industry press respects them. That means that when they have a new release to announce, people tend to pay attention. Chilli Heat was no exception to that rule. The online casino resource website Casinopedia, which acts as a hub of industry news, took the time to review Chilli Heat shortly after the game was launched. Their thoughts on the game are full of positivity; they warn players that it doesn’t have a high top jackpot when compared to some other slot games, but it does pay out smaller prizes quite regularly and reliable, which balances it out. We were also pleased to see that they agree with us about the money bag scatter symbols! Casinopedia isn’t without rivals to the service it provides; Online Casino Reports covers all the same areas of interest, and largely functions in the same way. They were also paying attention when Pragmatic Play released Chilli Heat, so they wrote their own review and were similarly impressed with the game’s quality. The review speaks favourably of the game’s bright colours and happy atmosphere, going on to predict that it would likely enjoy a long period of popularity with players.